Spanning 3 Generations, and 80 Years in the Business. 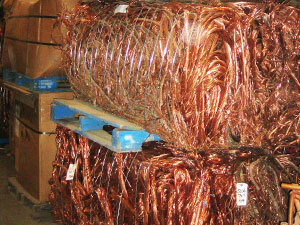 Nearly all of that 0.7 trillion (or 700 billion) pounds is still in circulation because copper's recycling rate is higher than that of any other engineering metal. At Safran Metals, we provide the necessary service of buying and processing non-ferrous metals for companies around the world. As the leader in the scrap metal industry, our mission is to provide the highest quality of service and satisfaction possible. Loyalty & Longevity - At Safran Metals we pride ourselves in developing an environment that nurtures longevity and loyalty. Most of our staff has been with us for a minimum of 10 years, with the majority having spent over 20 years at Safran Metals. This level of experience helps ensure that our employees are all highly knowledgeable in the buying, selling and grading of all non-ferrous metals. A Strong Reputation for Honesty and Reliability -	With 70 years of service in the scrap metal business, Safran Metals has gained an expert knowledge of the industry and understands how to meet the many needs of our customers. To us, the customer comes first, and we know that as one of the most trusted name in the business, we can ensure a happy and lucrative business relationship.